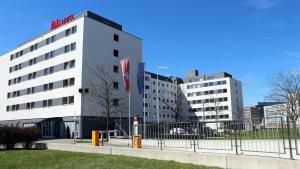 The Ibis Zürich Messe-Airport is situated a 10-minute walk from the exhibition centre (Messe Zürich) and the Hallenstadion Stadium. It offers a free shuttle transfer from and to Zurich Airport, which is only 5 km away. Here you will find comfortable, air-conditioned rooms with a cosy and a functional bathroom, 3 meeting rooms, and a bar, which serves snacks and drinks around the clock. Free WiFi is provided throughout the hotel. Private parking spaces are available on spot and the city centre of Zurich is 8 km away.